KLM Royal Dutch Airlines will operate Boeing 787-9s on a twice-weekly summer-season service between Amsterdam and San Francisco from May 4. The seasonal service, which will be in addition to KLM’s daily, year-round Amsterdam-San Francisco service operated by 747-400s, will mark KLM’s first deployment of 787-9s on a route to the United States. KLM introduced its first 787-9 Dreamliner on November 23, 2015 and now flies the type on ssrvices linking Amsterdam with Abu Dhabi, Muscat, Rio de Janeiro, Osaka, Delhi, Hangzhou, Xiamen and Chengdu. KLM’s schedule for its Amsterdam-San Francisco summer-season service with the 787-9 will see flight KL609 leaving Amsterdam Airport Schiphol (IATA code AMS) at 12:40 p.m. on Wednesdays and Sundays from May 4 and landing at San Francisco International Airport (SFO) at 2:45 p.m. local time. In the other direction, flight KL610 will depart SFO at 4:45 p.m. On Wednesdays and Sundays from May 4 and will arrive at AMS at 12:15 p.m. the following day, local time. 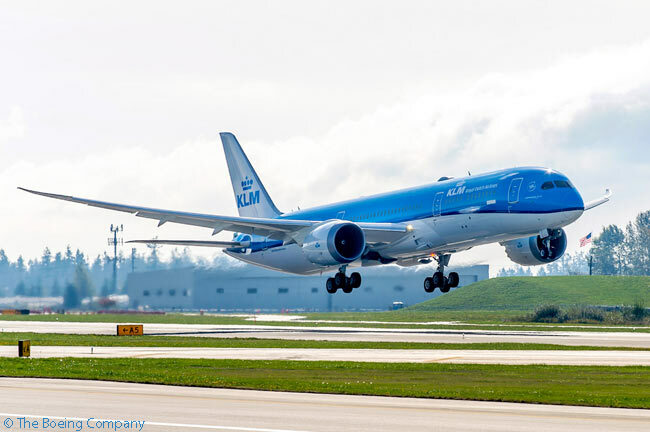 “San Francisco is the first gateway in North America to receive KLM’s Boeing 787-9 Dreamliner as we continue to invest in supporting growing demand for our West Coast routes,” says Eric Caron, general manager U.S.A. for Air France-KLM. KLM’s Boeing 787-9s are fitted with onboard Wi-Fi, marking the launch of KLM Wi-Fi, which was tested in earlier trials. The Dutch airline has outfitted the Business Class cabins of its 787-9s with new, full-flat World Business Class seats. Every World Business Class seat in the Boeing 787-9 has direct aisle access. Meanwhile, KLM’s 787-9 Economy class seats recline 40 per cent more than its previous aircraft types and each passenger has access to a power socket where mobile devices can be recharged. In its 787-9s, also, KLM has installed a renewed Economy Class in-flight entertainment system, offering a larger, 11-inch screen, intuitive HD-quality touchscreens, interactive 3D maps, and the option to communicate via Seat Chat with fellow passengers who are not seated nearby. KLM’s 787-9 in-flight entertainment system provides access to more than 150 films and 200 TV programs in 12 languages, including a large number of local films.